Ambassador Gets New Shoes! 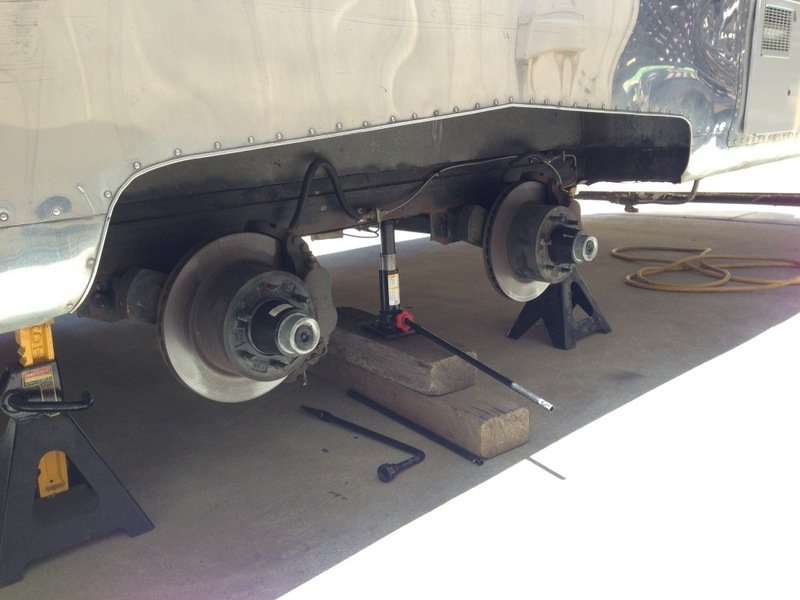 | 1960 Airstream Ambassador Blog! I’ve been thinking for a couple of years now that I should replace the Ambassador’s tires. 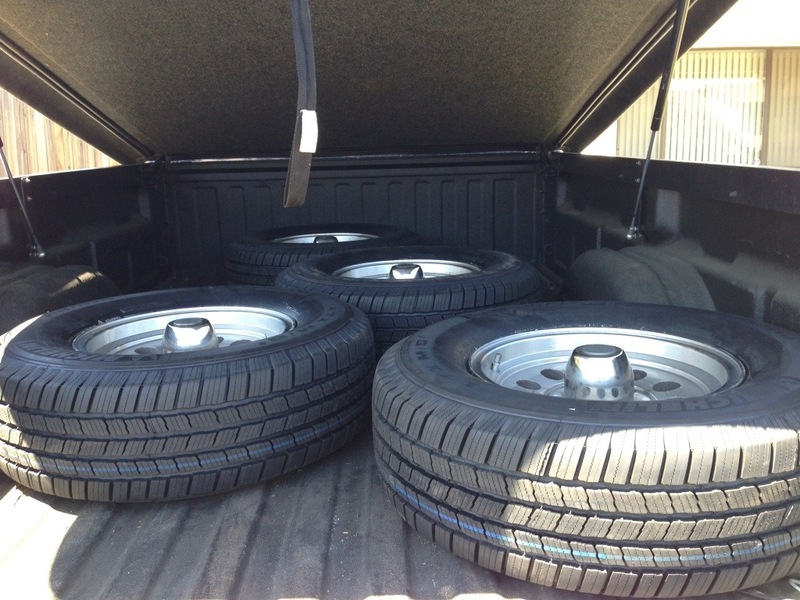 As I mentioned in my book, Restoring a Dream, I purchased my tires before I even picked up the trailer. 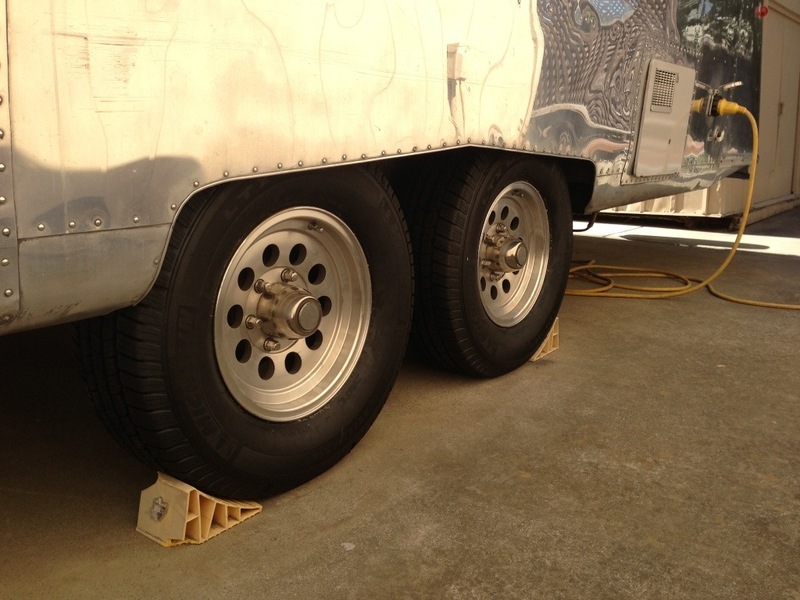 The rule of thumb is to replace trailer tires every five years, regardless of how they look. I kept thinking it had been five years, as it turned out it was much longer. 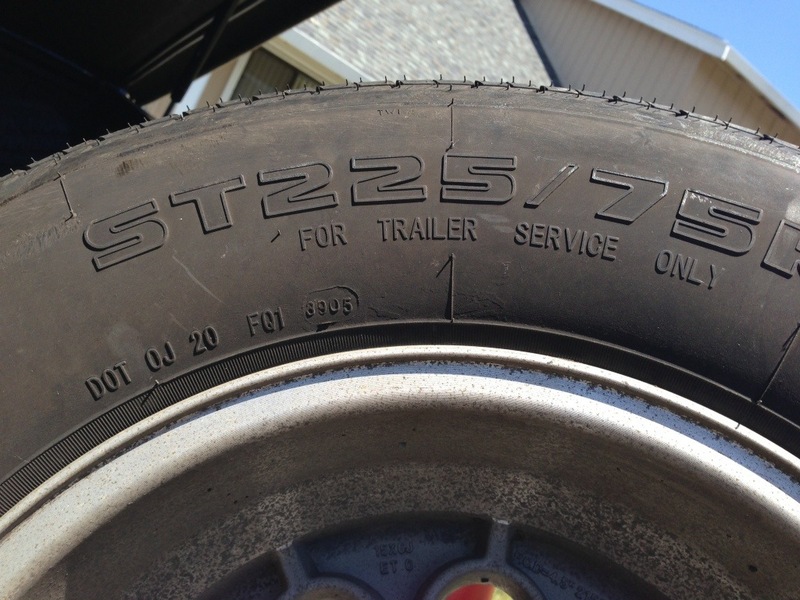 The trailer tires Les Schwab sold me were ST225/75 R15’s made in Beijing China. If you look closely, you can see the four digit date code 3905. This represents the 39th week of 2005. That would make them about eight years old! I started researching tires and found that a lot of people have problems with trailer tires made in China. Even Goodyear Marathons have been getting a bad rap online, primarily the versions made in China. 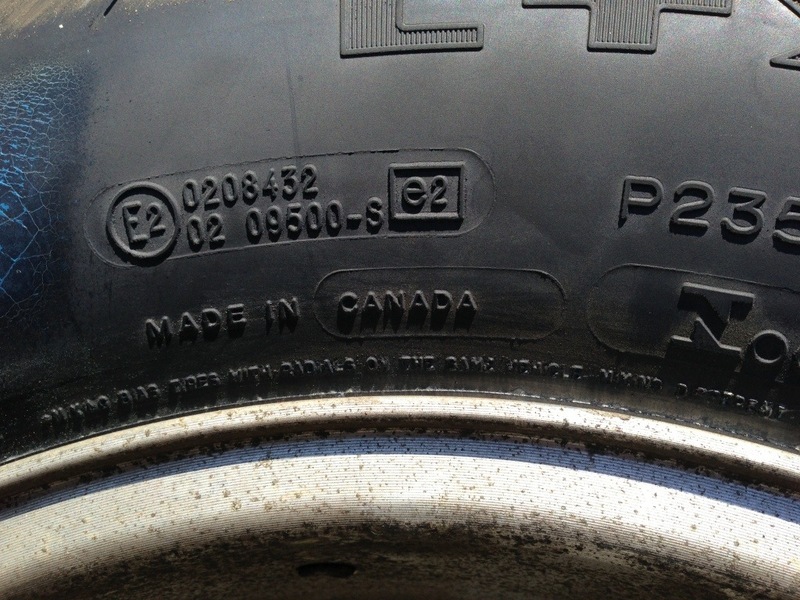 It’s so bad, that these China-made tires have been nicknamed “China Bombs”. The name refers to the fact that they literally explode going down the road and take out a good section of trailer with it. Now is it because the tire is at fault, or is it improper maintenance? Has the tire been overloaded, under-inflated? We may never know, but the ones built in China seem to get the brunt of complaints. The only ST (the designator for Special Trailer) tire people seem to be happy with are the Thailand-made Maxxis 8008 tire. To my knowledge there are no US made ST tires. The Maxxis seem to be hard to find, but most shops can special order them. One common complaint on any of the ST-built tires is that they are rated for their loads at 65MPH. A lot of people tow at that speed, so they are basically running the tire at the max limit consistently. In general, the common theme regarding ST tires are that they are built to less quality standards then automobile tires. This is causing many people to move to a light truck or LT tire, away from the Special Trailer altogether. Personally, I never had any problems with my “China Bombs”. I never had a flat or blowout of any kind. 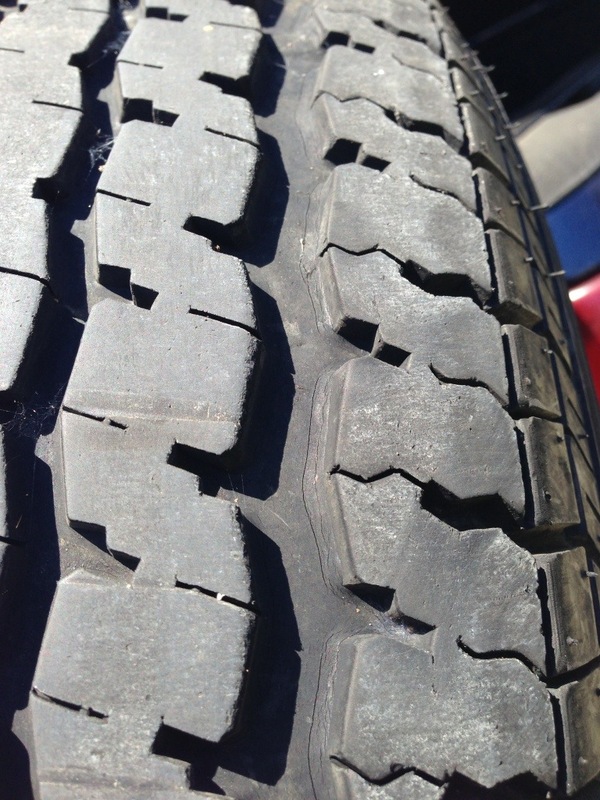 No tread separation or even any sidewall cracking. That’s probably why I kept putting off replacing them. I was diligent about checking the tire pressure and lug nut torque over the years. Once I removed them, I looked them over carefully and found some slight cracks between the treads. So now I’m stuck. I need new tires, but certainly don’t want “China Bombs”. I could go with the Maxxis brand, but then there is the 65MPH and overall build quality issues. So I decided to call Colin. It turned out he had just purchased new tires for his 59 Ambassador. Colin went with Michelin LTX M/S2 tires. These are a light truck cross over, which means Michelin recommends them for pickups and SUVs. They do not specifically recommend them for trailers. Besides the build quality, there is the difference of load-rating. My “China Bombs” had a load-rating of D, which to the best of my knowledge is around 2500 lbs. The Michelins are rated for 2183 lbs at 50 psi according to Tire Rack. Now remember, our vintage trailers are only 4000-5000lbs, so the 2183 rating is more than we need. Most trailers weigh a lot more than that, so watch this specification carefully. There are a lot of people who switch to a 16 inch wheel just to get higher load-rated LT tires options. I decided on the Michelin tires. I can’t say that it was a good move yet, check back in about five years. I do know that I’m certainly not the first to switch to a LT tire and won’t be the last either. Please don’t take this post as a recommendation from me or Colin. I’m just stating what I’ve found from my last 24 hours of research. So do your own research. If you have a problem with your tires, I don’t think saying, “That a guy on the Internet, who did 24 hours of research, said they’d be OK”, is a proper defense! On with the swap. I decided to take the wheels off instead of towing the trailer to the shop. I just figured it would be easier in the end. 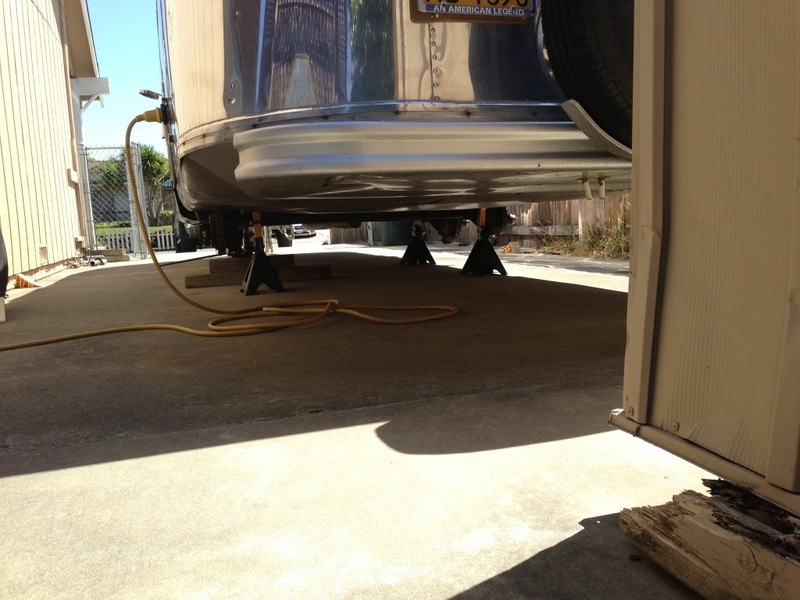 I propped the trailer up on jack stands which is always an eerie thing to me. I did tell them at the shop that I wanted to see the date code. 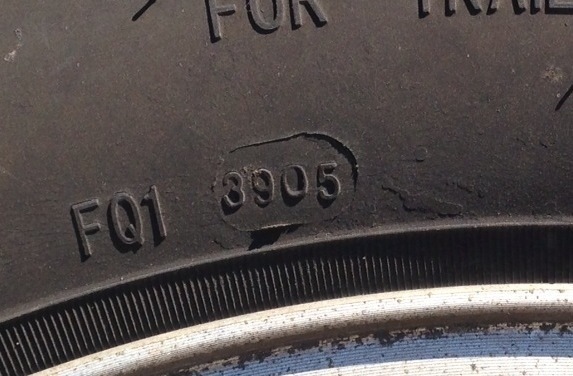 The newest tires were 5112, which is the 51st week of 2012. Pretty new I figured, only six months old. I also paid to have them balanced, yes even though it’s only a trailer. Here’s my new shiny Ambassador shoes! My aluminum wheels are spec’d to tighten the lug nuts to 100ft/lbs. 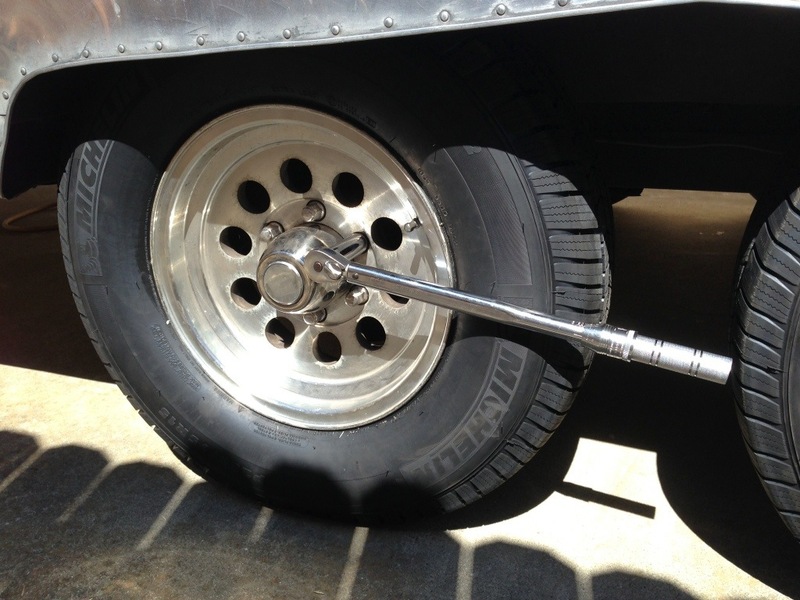 I have a torque wrench I keep just for this purpose. I also recheck the torque after driving about 50 miles. Of course it turned out to be 98F outside today, not the best day to do this work, but now it’s done! Nice new tires ready for the road! Oh ya, by the way, the Michelin’s were made in Canada. This entry was posted in on June 7, 2013 by Tim.